In celebration of the inaugural edition of “Les Voiles de St Barth” regatta, title sponsor Richard Mille introduces a limited edition titanium dive watch, the RM 028 Les Voiles de St Barth. This 100-piece special edition pays tribute to the international yacht race that took place in the Caribbean waters surrounding St Barth from April 6th to 11th, 2010. With the introduction of the RM 028 in 2009, Richard Mille combined the exceptional case and skeletonized movement that has become the hallmark of all Richard Mille watches, with the specific timepiece features required of divers and sailors alike. construction and 22 torque screws, with complete integration of the lugs into the case system. This configuration prevents any accidental dislodging of the bezel from its case while diving. The skeletonized automatic movement of the RM 028 utilizes a rotor with variable geometry, a major innovation of Richard Mille that allows the level of automatic winding to be adjusted to the user’s lifestyle via the setting of two 18K white gold wings. The RM 028 Les Voiles de St Barth edition is distinguished by elements in bright yellow, a prevalent color in all sailing and diving pursuits. Yellow rubber protects the crown, and the vibrant shade adorn the bezel. 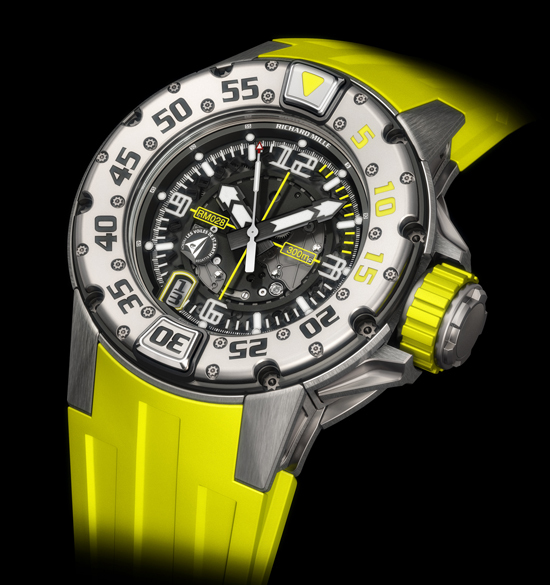 The watch is also presented on a yellow rubber bracelet, a first for the Richard Mille collection. Finally, the logo of Les Voiles de St Barth resides on the dial above 8 o’clock.